Legislation moving Texas closer to allowing open carry of handguns finally cleared the state Senate late Friday evening after the chamber was thrown into hours of tense debate over a controversial amendment limiting the power of police to stop people visibly carrying guns. "This is just a back door to constitutional carry because really any person could just carry a gun without a license because they know the police can't inquire of them if they have a license," said state Sen. Joan Huffman, R-Houston, who unsuccessfully attempted to heighten penalties for carrying handguns without a license during the debate. Democrats Rodney Ellis of Houston and Royce West of Dallas threw their support behind Huffines, saying that — while they oppose open carry itself — with the bill all but certain to pass, they wanted protection from racial profiling by police. "I have a long history of opposing open carry legislation and a strong record of supporting sensible reforms to reduce gun violence and keep firearms out of the hands of criminals," Ellis said in a statement he released after the vote. "But if open carry is going to become law, law enforcement shouldn't be able to circumvent constitutional rights and detain someone solely because they are open carrying in compliance with the law." Five other Democrats voted with Huffines: José Rodríguez of El Paso, Carlos Uresti of San Antonio, Eddie Lucio of Brownsville, Juan "Chuy" Hinojosa of McAllen and Sylvia Garcia of Houston. 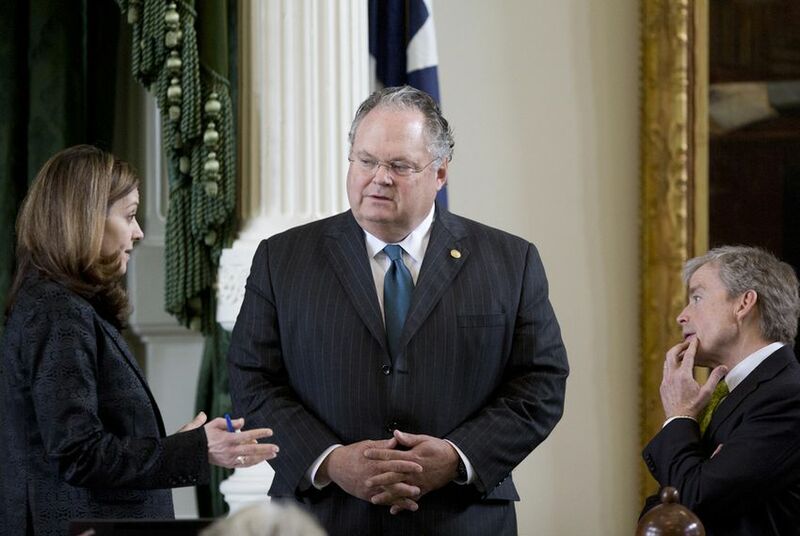 Besides Huffman, Republicans including bill sponsor Craig Estes of Wichita Falls, Donna Campbell of New Braunfels and Robert Nichols of Jacksonville, argued fiercely against the amendment, which they said would create unnecessary confusion for law enforcement and threaten overall support for the bill. Huffman, a former judge and prosecutor who grilled Huffines on his amendment for almost an hour on the Senate floor, said she thought the provision was a “poison pill” for the legislation. The measure also faced heated opposition from state Sen. John Whitmire, the Houston Democrat who chairs the Criminal Justice Committee, who argued that numerous police departments and law enforcement organizations were staunchly opposed to the measure. Whitmire, who said the amendment was “a game-changer” that would endanger the lives of police officers, pleaded with Huffines to consider the consequences of his proposal on law enforcement. The legislation will return to the House for a final vote before it heads to Gov. Greg Abbott, who has said he will sign any open carry legislation that reaches his desk.